Get Your Radial DIs Off the Floor! Tired of your messy, cluttered studio? Clean it up by rackmounting your Radial DIs. The Radial J-Rak 8 is the perfect solution to help keep your studio cleaner and more organized. This 2U rack shelf holds up to eight Radial JDI-sized interfaces. With the turn of a few simple screws, you can mount your favorite DIs into one convenient rack shelf. The J-Rak is great for studios or permanent rackmount installations at venues. You can front- or rear-mount each unit to access the inputs and controls you need. Place your Radial DIs in a convenient, rackmountable shelf with the Radial J-Rak 8! Clear up the mess and cable clutter with the Radial J-Rak 8. 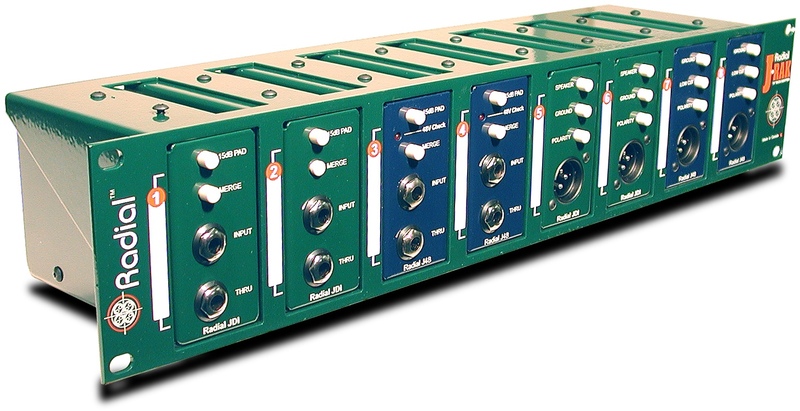 Now you can rackmount up to eight of your favorite Radial DIs or splitters in this 2U rack unit. Easily convert each unit to fit in the J-Rak in just minutes. Any Radial device that uses the JDI form factor will fit. Now you can haul all of your DIs in the easy-to-carry Radial J-Rak 8 rackmount unit. Each DI in the Radial J-Rak 8 can be reconfigured in just minutes. With the turn of two screws, you can switch out and reposition any unit. Front- or rear-mount each DI to have access to the inputs, outputs, and controls that you need. You can also mix and match DIs and splitters to accommodate the need of each session or gig. Made from ultra-strong 14-gauge steel, the Radial J-Rak 8 was designed to last a lifetime. You won't need to worry about this rack shelf falling apart. An extremely durable baked-enamel finish will keep your J-Rak looking great!